SASO 2017 children’s concerts both SOLD OUT! Hundreds of noisy kids with their mums and dads are looking forward to a fun-packed introduction to classical music on Sunday 19 November when St Albans Symphony Orchestra performs its annual concerts for children (2pm and 3.30pm, St Saviour’s Church, Sandpit Lane, AL1 4DF). But – with a week still to go – both concerts are a sell-out success, with no more tickets available. This year, conductor Tom Hammond will be telling the story of ‘Watling the Bear’ with help from The Three Bears Phantasy by English light music master Eric Coates. His score wittily transforms a musical rendering of ‘Who’s been sitting in my chair?’ into fairy-tale magic. On a more serene note, the programme will include the beautiful Scene with Cranes by Sibelius, featuring young dancers from the Let’s Dance Academy in St Albans. Children can also look forward to hearing the bells. drums, trumpets and other excitement from the final pages of Tchaikovsky’s 1812 Overture – stirring music that the orchestra recently performed in its entirety in St Albans Cathedral. Another highlight of the concert will be the opportunity for children to try out the musician’s instruments during the interval. 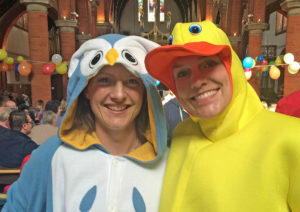 As ever, many members of the orchestra will be putting on fancy dress for the occasion and children are invited to do the same, if they would like to do so.